MashButtons: Motherflocker! Herd your sheep with Flock! Coming to the XBLA next week (fairly sure), is Flock! from Capcom. The downloadable title, which will also be available on the PSN, and PC, will debut the latest "UFO gameplay", a term in which I've dubbed Flock! 's game style. 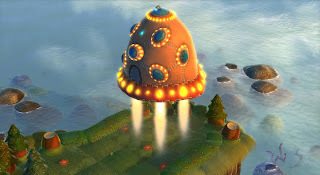 Best suited to be put in the puzzle/platformer genre, you pilot a UFO, who's main goal is to herd various farm animals to the mothership, through an assortment of 'puzzle-filled interactive levels, including corn fields, pastures and other “plushie”-like environments'. In order to succeed, players will have to manage the quirkiness of the animal’s distinct behaviors, as well as solve a series of environmental puzzles using Flock’s! physics-based gameplay. The animals that populate these islands – sheep, chickens, pigs, cows and more – respond to the UFO in all kinds of eccentric ways based on their nature. 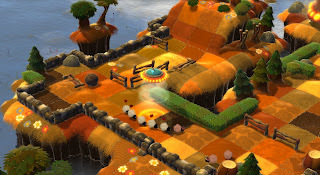 By finding or creating a passable route across a level, players can herd the animals safely toward their ship. 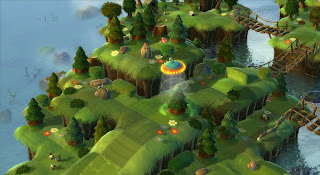 Solving the puzzles within the suggested time limit yields exciting rewards, but players can also take their time in order to find more hidden bonuses. With a unique theme, clever humor and easy pick-up-and-play controls, Flock! promises to be an instant hit with gamers of all ages! As of now, the price is not locked in, at least for us to know. Given the amount of gameply, I'd expect something in the 1200/1600 points level ($15-$20 for those of you not using space money). Here's a video to whet your appetite, we're hoping to have the Qore video up later today, so be sure to come back and check out the behind the scenes on the game.